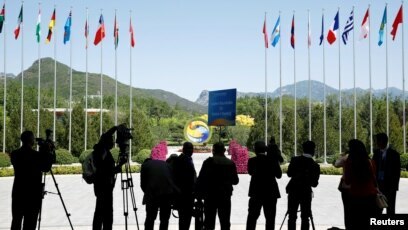 FILE - Journalist take pictures outside the venue of a summit at the Belt and Road Forum in Beijing, China, May 15, 2017. 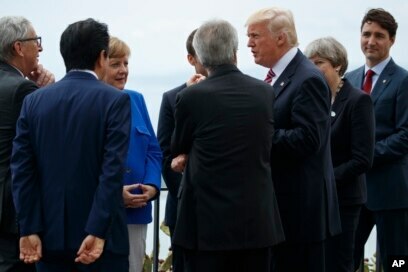 President Donald Trump poses for photos with G7 leaders at the Ancient Greek Theater of Taormina during the G7 Summit, May 26, 2017, in Taormina, Italy. ​The United States has been particularly critical of Italy's decision to sign up to the plan this month, during a visit by Xi to Rome, the first for a G7 nation.